Rather than the traditional guest book, why not give your friends and family the chance to offer ideas on what the couple should do next, whether it’s a place you need to visit or something you have to do. 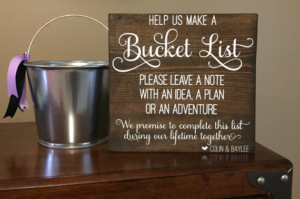 Set up an area at your reception with pens and notecards, alongside a chalkboard or sign that explains the ‘bucket list’ concept. Terrariums are a simple way to bring a touch of geometric charm to your table centerpieces. With plenty of glass designs available from garden centres and homeware stores in a range of shapes and sizes, you can then add flowers and succulents that perfectly fit your theme. You could even make them as an activity at your bridal shower! Add a personal element to your table numbers with tidbits of trivia about the happy couple – from where you first met to when you had your first kiss, it’s a lovely way to tell little stories to your guests that they may not know. Make your guests feel really special with personalised placecards in the form of animal figurines! Purchase a mixed pack online of whichever type of animal works best – be it farmyard or jungle – then use gold or silver spray paint to give them a luxe edge. 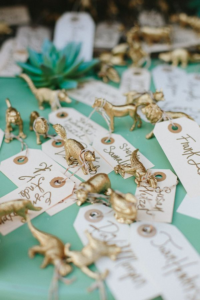 Match guests to an animal with nametags and set the table; guests can take them home as keepsakes, too! Perk up your drinks with some fancy ice cubes. 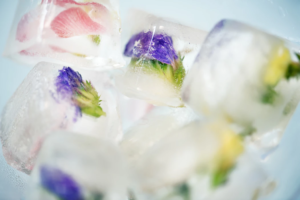 From edible flowers and glitter to food colouring or sprinkles, simply add your chosen extra to the ice cube trays when adding the water and leave them to set. Give a vintage mirror a new lease of life; prop it up on an easel and use a liquid chalk pen to write a welcome note or seating plan. 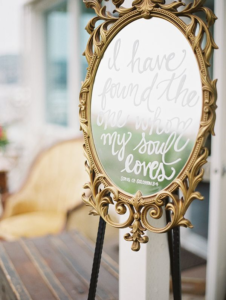 You could even use a metallic spray paint to give the frame a more refined and elegant look, depending on your wedding style. 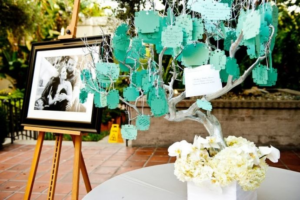 Create an incredible memento by letting your guests snap a picture of themselves in place of the guestbook. 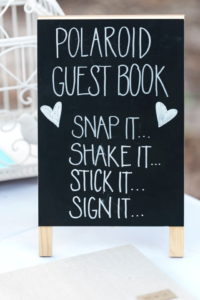 This works best if you leave a polaroid camera in place, with the idea being that guests take a picture, stick it either in a book or on a board, then write a little note on the back. Give your guests a wedding favour they’ll actually use with these mini emergency kits. Fill them with things like safety pins, hair clips, hair bobbles, plasters, individual hand wipes or any other bits and bobs that people always need in an emergency. To create special keepsakes from the day, you could ask guests to leave you their ‘wishes’. There are a number of ways you could make these DIY, from using star-shaped cards that guests can write on and place in a vintage mason jar, to creating a visually striking ‘wish tree’ where guests can hang their notes on the branches. 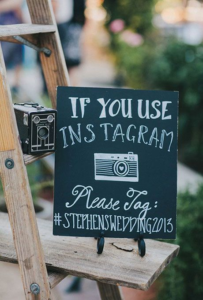 One of the easiest DIY things you can do for your wedding is to encourage people to take photos and share them on Instagram with a personal hashtag – add it to the invitations, the place cards, put up signs and ask people to tag anything they post! Hopefully, after the day you’ll then get to see your wedding through your guests eyes and have a big collection of shots.